Still, we always like to celebrate growth -- whether it be physical, developmental or motor. I've recently become a Brand Rep for Little Monkey Designs, a great local company based in Oshawa, ON. Diane Reitano started the company while on maternity leave with her first child. Her first creation? Custom Personalized Growth Charts. These growth charts are awesome; not only are they designed and made in Canada, they are affordable and come in a variety of different patterns. 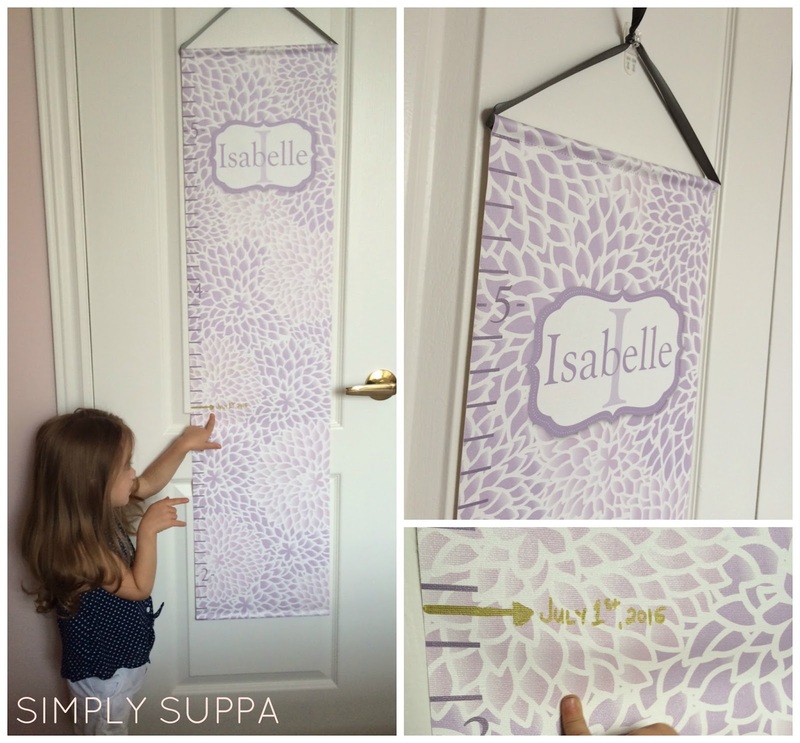 Isabelle's growth chart is made of canvas and the colours match her room perfectly. How lucky was that!? Not really. To ensure perfect colour matching, Diane has her online boutique set up to accept photographs of the room, or the specific paint shade. Ingenious, really. Ordering is also really easy; once the design is ready, you'll receive a proof and it's in the mail shortly thereafter. Funny sidebar: when our growth chart came in the mail, I happily announced it was my package from Little Monkeys, to which Isabelle excitedly questioned, "There's a little monkey in there!?" Super cute. Hanging the growth chart is also very simple. It's so lightweight a single nail will do, or you can go for a removable 3M hook, like I have. I opted to use a metallic permanent marker to add my daughter's height, complete with the date. I also like how portable the growth chart is; if we ever move, we can roll it up and take it with us to our new home. Simply Suppa readers will have an exclusive opportunity to score a beautiful Personalized Growth Chart (and anything else on Little Monkey Designs). Use the promo code SuppaMonkey to take 15% off your entire order. Visit their website to start your order. Disclaimer: I am a Brand Rep for Little Monkey Designs and receive special perks as a part of my affiliation. As always, all opinions expressed on my blog remain my own.